Our team of qualified electricians can design, install and maintain all types of electrical systems from General Power to lighting, heating and alarms. Do you have old storage heaters that need removing? Are you worried about Asbestos? Do you need advice on whether to invest in storage heaters or panel heaters? Have you considered an LED upgrade? Overall, you can save time, money and energy with LED lighting. How old is your Distribution Board? In reality, older distribution boards are prone to electrical faults and overheating, increasing the likelihood of fire. Want to know what’s new in Outdoor lighting? Whether you are looking to add a focal point to your garden or increase the security around your property. Do you need Re-wiring works? New circuits or cables re-routed? Has your property been re-wired in the last 25-30 years? If not, you will need to consider an upgrade to comply with British standards. Since 2005, all domestic electrical work must comply with part ‘P’ of Building Regulations. Part ‘P’ refers to legislation that ensures domestic electrics meet with current health and safety requirements. 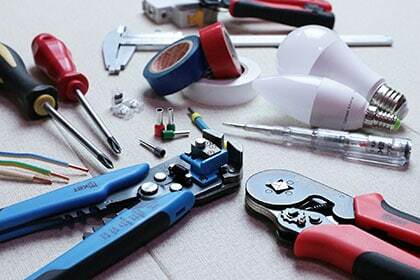 In order to comply, a professional must install or test all electrical work. It is likely that old installations are inadequate to deal with the demand for electrical devices in your home. This does not legally enforce you to update your existing wiring. However, If you are adding to existing installations or making significant alterations, it is essential that you consult an electrician. Overall, the best advice is to have a qualified electrician carry out an Electrical Installation Condition Report (EICR) to assess whether your property needs re-wiring.